Ukrainian earth ionosphere satellite. Cosmos 215. Studied the optical characteristics of the atmosphere. Radiation observatory; 8 telescopes. 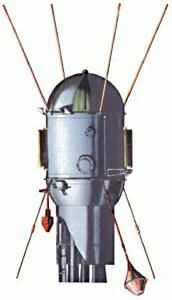 Science, upper atmosphere satellite built by Yuzhnoye, Russia. Launched 1968. Used DS Bus. Status: Operational 1968. First Launch: 1968-04-18. Last Launch: 1968-04-18. Number: 1 . Gross mass: 385 kg (848 lb). Family: Earth, Ionosphere sat. Country: Ukraine. Launch Vehicles: Kosmos 2, R-12, Kosmos 11K63. Launch Sites: Kapustin Yar, Kapustin Yar LC86/4. Agency: MO, Yuzhnoye. Bibliography: 2, 474, 6, 99, 12269. 1965 June 22 - . LV Family: R-12. Launch Vehicle: Kosmos 11K63. Scientific Kosmos satellites approved. - . Nation: Russia. Spacecraft Bus: DS. 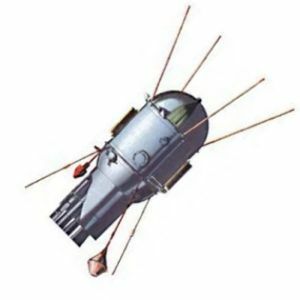 Spacecraft: DS-U1-A. Ministry of General Machine Building (MOM) Decree 'On Preparations in 1965-66 of 18 Small Unifunctional Earth Satellites for Carrying out Scientific Investigations-creation of small scientific satellites at OKB-586' was issued..
1968 April 18 - . 22:29 GMT - . Launch Site: Kapustin Yar. Launch Complex: Kapustin Yar LC86/4. LV Family: R-12. Launch Vehicle: Kosmos 11K63. Cosmos 215 - . Payload: DS-U1-A s/n 1. Mass: 385 kg (848 lb). Nation: Russia. Agency: MO. Program: DS. Class: Earth. Type: Ionosphere satellite. Spacecraft Bus: DS. Spacecraft: DS-U1-A. Completed Operations Date: 1968-06-06 . Decay Date: 1968-06-30 . USAF Sat Cat: 3205 . COSPAR: 1968-033A. Apogee: 403 km (250 mi). Perigee: 255 km (158 mi). Inclination: 48.40 deg. Period: 91.00 min. Studied the optical characteristics of the atmosphere. Radiation observatory; eight telescopes..